Austin indie band Shearwater’s last album, Rook, was our 2008 top album, and deserved­ly so. 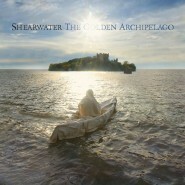 Now, almost two years lat­er, Shearwater’s put out their newest album, The Gold­en Arch­i­pel­ago. Even though it will nat­u­ral­ly be com­pared to such an excel­lent album, The Gold­en Arch­i­pel­ago stands up well, com­bin­ing the gor­geous musi­cal detail that lies at the core of Shearwater’s music with a new shift towards more typ­i­cal rock dynam­ics. It’s not quite the mas­ter­piece that Rook was, but it’s still very good. From a pure­ly instru­men­tal stand­point, The Gold­en Arch­i­pel­ago is just as mas­ter­ful as its pre­de­ces­sor, and in some cas­es, like the first cou­ple tracks, the two albums are fright­en­ing­ly sim­i­lar. Direct com­par­isons aside, Shear­wa­ter pays very close atten­tion to both the minute details and the larg­er con­cepts and sec­tions. The low strings of “Merid­i­an” and the tremo­lo of “God Made Me” are excel­lent addi­tions that sub­tly shape the track, but “God Made Me” also has one of the best larg­er tran­si­tions, about two thirds of the way through, of the entire album. All togeth­er, the musi­cal deci­sions on The Gold­en Arch­i­pel­ago suc­ceed more than a few times at leav­ing mouths gap­ing. The Gold­en Arch­i­pel­ago also has a nice lev­el of diver­si­ty. While a few tracks towards the end tend to blend togeth­er, the vast major­i­ty of the tracks remain their own unique expe­ri­ence. Some­times this can get slight­ly odd; the rau­cous per­cus­sion of “Land­scape at Speed” works counter to the oth­er­wise relaxed track. But for the most part, diver­si­ty is a high­ly wel­come ele­ment, giv­en the nar­row­ness of the niche genre Shear­wa­ter have hap­pi­ly invent­ed for them­selves. Jonathan Meiburg’s vocals are as beau­ti­ful­ly done on The Gold­en Arch­i­pel­ago as we’ve come to expect from him, soft and sub­tly pow­er­ful in a way that infus­es Shearwater’s music with ener­gy. Meiburg’s voice is at the same time a reli­ably con­stant ele­ment of the music (and an always excel­lent one) and one which is ful­ly capa­ble of effort­less­ly defin­ing the direc­tion of the music. In this way, Meiburg sings the vivid images of The Gold­en Arch­i­pel­ago, his voice an essen­tial part of the expert­ly formed sound. The birds fly­ing through the organ­ic land­scape cre­at­ed by Shear­wa­ter are as appro­pri­ate as ever for a band named after a seabird - and as majes­tic and poet­i­cal­ly illus­trat­ed as pos­si­ble. When Meiburg sings of “effort­less gulls in the wake” on the album’s final track, it’s impos­si­ble not to imag­ine the scene he’s cre­at­ed, the mix­ture of nature as rep­re­sent­ed by the gulls and “the vio­lent surg­ing of life.” As “Black Eyes” urges the lis­ten­er to “Come down from the lion’s back / Call down to the end­less sleep­ers / Give life to the dim­ming days / That run in an end­less stream now,” the track builds, inten­si­fy­ing the already strik­ing image. The Gold­en Arch­i­pel­ago, filled to the brim with sim­i­lar images, is noth­ing less than pow­er­ful and res­o­nant. Rook was a defin­ing moment for Shear­wa­ter. Sig­nif­i­cant­ly clean­er and more focused than much of Shear­wa­ter, or it’s par­ent band Okkervil River’s pre­vi­ous works, Rook cre­at­ed an entire new area for Shear­wa­ter to explore, and The Gold­en Arch­i­pel­ago read­i­ly engages in this explo­ration. While its sound is not as new as Rook’s, it’s fur­ther devel­oped, and still extreme­ly inter­est­ing. It has lost some pow­er, opt­ing instead for care­ful musi­cal­i­ty, but this trade­off seems to have worked well for Shear­wa­ter, now able to claim yet anoth­er suc­cess.